Roller Derby is a mixed bag community. Players come from all walks of life. It is a veritable melting pot of backgrounds. You have people who are married, divorced, pansexual, bi-sexual, homosexual, professionals, stay-at-home parents, the former cheerleaders, the former misfits, every nationality under the sun, etc. I think it is why it’s so easy for someone to fall in love with the sport because no matter who you are, you belong. Surprisingly enough, it reminds me of the mental health community. Much like the sport, mental illness does not discriminate. I also see a great benefit for those with mental illness to play roller derby. Roller Derby can be a regular form of exercise. I am sure if you have sought after any kind of professional health for a mental health issue, you have heard the importance of exercise. It has been proven to help improve moods. 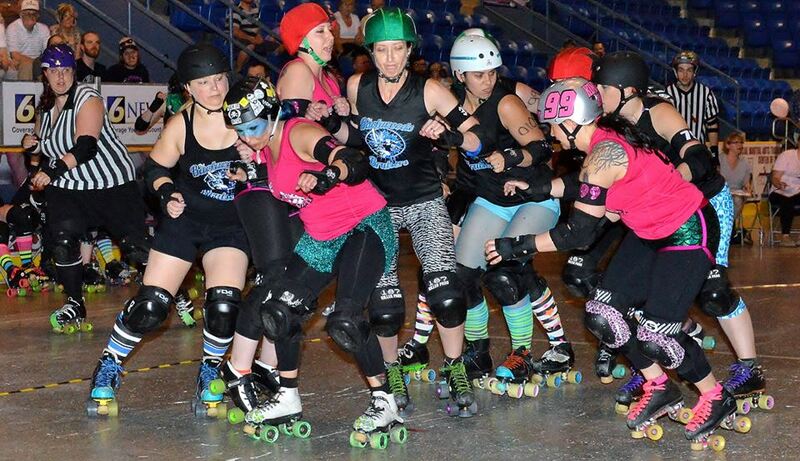 If you strip away all the fishnets, tutus and glitter, Roller Derby is a sport. It is a tough sport. You need endurance and physical strength to be an effective player. Many practices consist of exercises and endurance drills outside of playing the actual game. 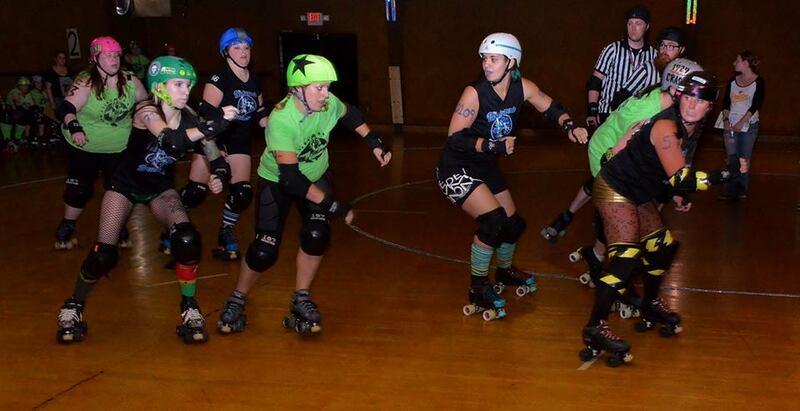 As a jammer, you need to be able to keep up your speed once you break through the pack. As a blocker, you have to the core strength to keep yourself from just being knocked over. Keeping yourself upright on skates is rather difficult when people are trying to knock you over while doing laps around a track. It is also advised, as with any sport to have outside training. Going to the gym or at home workouts are highly suggested. Also, there is this amazing phenomenon known as “derby booty” which your jeans will thank you for. Seriously, take the time to google it. 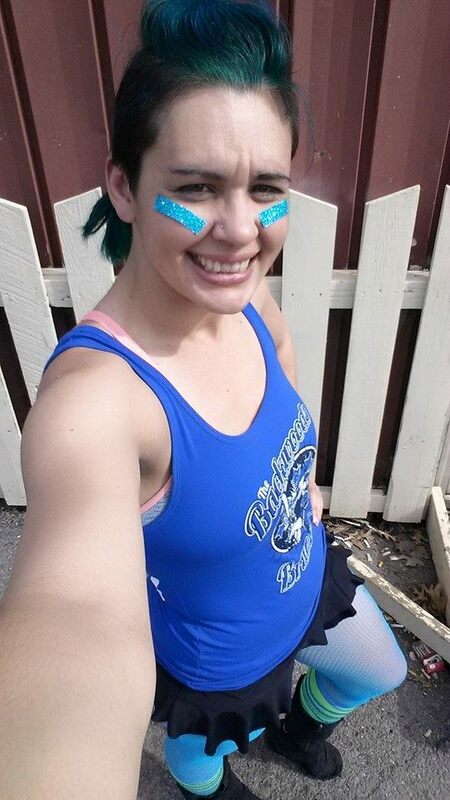 Roller Derby helps you gain confidence. Making it through the pack. Now these are just a small list of things about roller derby that can make you feel amazing about yourself. Positive reinforcement and goals are great ways to help cope with things like depression and anxiety. Knowing that you belong and you are needed. Illness like Depression, Social Anxiety, and Bipolar Disorder have a great way of killing your social life. There is always that paranoia that you aren’t needed and that people are better off without you. It is just not true with roller derby. You are part of a team and every player matters. It terms of how the game is played no one position is more important than another. Sure a jammer is the scoring person but if she doesn’t have a solid line of blockers, that jammers job has become a lot harder. Every player is important. Your team becomes like a second family. If you suddenly disappear, you better believe someone is going to come looking for you. It is just how derby works. When you step on the track be it for a bout or practice, your past doesn’t matter. It is not there to determine who you are as a player. Some the quiet most reserved people in the outside world are some of the toughest players on the track. Who the world determined you to be does not apply once you put on your skates. Your derby persona can be whatever you want it to be. Social butterfly. Class clown. Group Mother. It is all up to you. Your past and differences are left at the door. This also applies to your illness. Now before every one goes running to the nearest roller derby team fresh meat signup, please note this is a commitment. There are practices, home bouts, away bouts, meetings, outside activities like fundraisers, and other commitments that come with the territory. However for someone with a mental illness, it gives a potential for a routine. It also give something to look forward to. It can give you a purpose in this world when some days you may feel like you may not have one. Many teams have regular practices that you are required to attend to play in bouts. Sometimes the incentive to want to play in a bout is enough to get someone out of the house and head to practice. 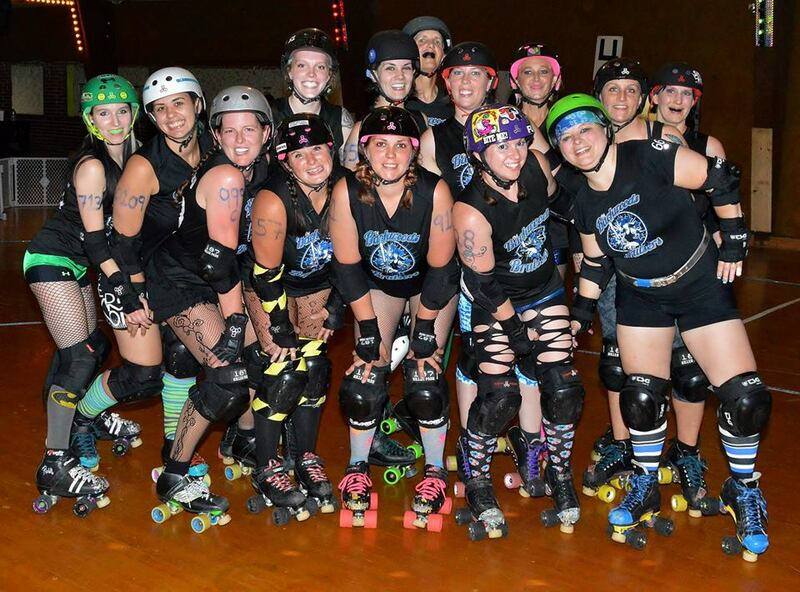 We are the Northern Allegheny Roller Derby! Now, am I saying that everyone with mental illness should play roller derby? No. Roller derby is not for everyone. It can be time consuming and there is the risk for injury. However for some it may be a very viable option that someone may not have thought of for treatment. As someone with bipolar disorder, I look forward to Tuesdays and Thursday. I love when I can shed Lauren Kocher for a couple hours and be Jersey Turnspike. 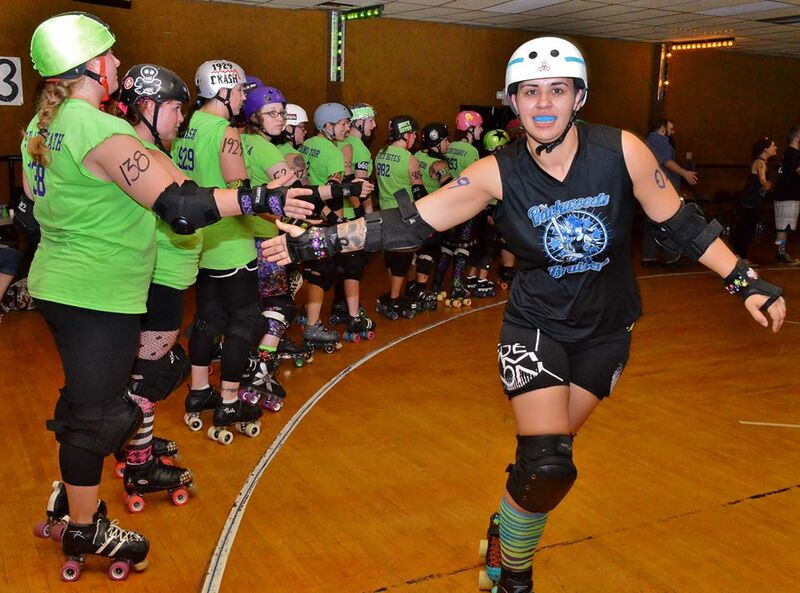 I have grown to love my derby sisters who see me as I am not how the world think I should be. I will warn you that the feeling is addicting. 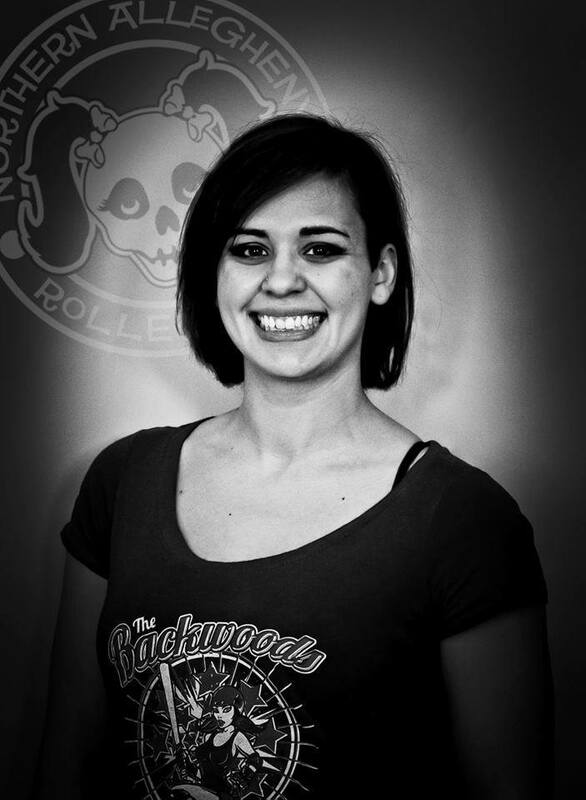 How does Roller Derby help you? Comment below. You obviously have knees of steel! Great advice for a lot of folks, though! I don’t do roller derby and never did, but as a child I was a speed racer and we had matches. Kind of on the same track. I 100% agree with all of the statements made above – both from my own personal experience and also as a roller derby coach. Time and time again I have seen roller derby help people find their own strength to get through the toughest of times and seen the support from the RD community given without judgement or expectation of reciprocation. 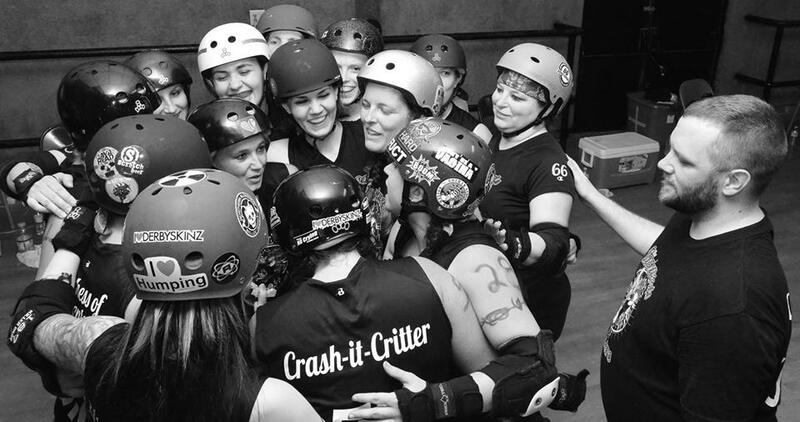 I am absolutely certain roller derby has saved some lives – and definitely some relationships!